Hi ya everyone! 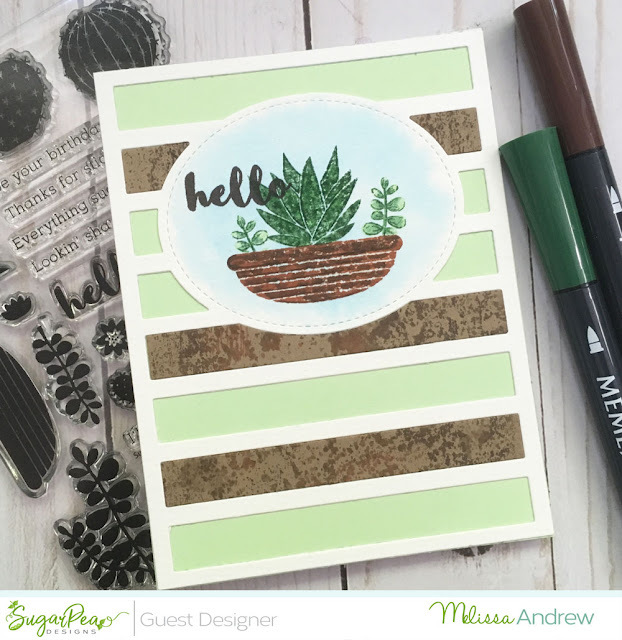 Another blog hop today and I'm sharing this adorable new cactus and succulent set. I wanted to try a more watercolored look on this card. After using the SugarCut die Large Striped Coverplate I stamped with my misti onto Bristol Smooth. I colored my stamps with my Memento Markers spritzed the stamp with water then stamped. Afterwards, I added some fine detail with the fine point tip of my markers. Don't forget to hop and remember all the products won't release until Friday! Love your gorgeous card! Great layout and colors!!! I really like the various colors you used in the background die. Great card. Gorgeous card. I love your color choice. That’s a lovely card ! I love your choice of colours. Love the earthy tones used on this fab card. Thanks for the inspiration. Really striking card. Love the colors. What a great idea with the rectangle windows! Wonderful card! The background so perfectly showcases your lovely focal image. Pretty card! Love the color combo you used! The Stuck On You set is awesome! FAbulous. Love the striped background. what a great combo of materials. Beautiful card. I really like the striped background.